The year 2013 is a meaningful year that marks the 130th anniversary of the establishment of diplomatic relations between Korea and Germany through the Treaty of Peace, Commerce and Navigation between Korea and Germany signed on November 26, 1883. This year also marks the 50th anniversary of the dispatch to Germany of Korea’s 18,000 mine workers and nurses, which started from 1963. The two countries have, for as long as 130 years, maintained active exchanges in diverse areas such as politics, economy, culture and social arenas. As both countries underwent a division of the nation, they also share many same experiences. 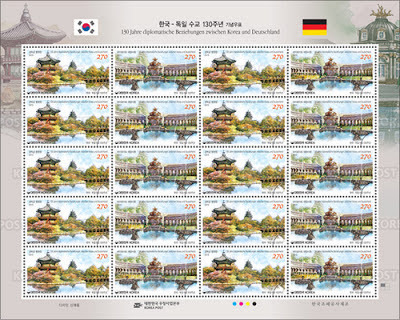 In celebration and commemoration of this 130th anniversary, a set of joint stamps is issued featuring Korea’s “Hyangwonjeong Pavilion in Gyeongbokgung Palace” and Germany’s the Temple of Sun in Bayreuth. The Joseon Dynasty built Gyeongbokgung, a new palace in Seoul in 1395, right after founding of the dynasty. In 1873, King Gojong had Geoncheonggung Palace built in Gyeongbokgung. In front of Geoncheonggung, a pond was dug, an island was created, and a pentagon-shaped 2-story pavilion was built. This is Hyangwonjeong, which means “the Pavilion of Far-Reaching Fragrance.” In front of Hyangwonjeong, a wooden bridge was constructed. This is Chwihyanggyo, meaning “intoxicated with fragrance”. Originally located to the north of Hyangwonjeong pavilion, Chwihyanggyo bridge is now gone, with only the newly built bridge on the south being seen now. Mingled with the surrounding nature, Hyangwonjeong pavilion, Hyangwonji pond, and Chwihyanggyo bridge produce splendid scenery all year round. Complete even with a fountain, the new palace built on a wide plot of the Hermitage boasts a very splendid appearance, as opposed to the old palace. Completed in 1753, the new palace was built in the shape of a semi-circle, with the temple of the sun (Sonnentempel) in the middle. To build this temple, Wilhelmine, the wife of Margrave referred a great deal to ancient myths. This was reflected in the design of the temple’s architecture: built with Corinthian style’s pillars, the temple is decorated with colorful pieces of glass and crystals. The best part of the temple is the gold-plated statue of the Sun God, who is riding a four-horse carriage on the round roof. During the reign of Mr. and Mrs. Margrave, Bayreuth developed into a magnificent city.